Bill's OBX Beach Life: The Light Air Wavesailing "Head Carry"
The Light Air Wavesailing "Head Carry"
I have seen forum posts and inquiries regarding the task of getting a light air kit to/into the ocean. Often main concerns include light air wave board weight, shorepound, and simply not knowing what to do. Folks mention a need to drag their kits into the water sliding along the sand/rocks for both entry into and exit from the beach break. A key technique to avoid both the drag and the shorebreak is the "Head Carry." The Head Carry technique is used regularly with traditional wavesailing. Both for entry into the water as well as exit from. Additionally the head carry is often used for the "walk of shame" for those blown downwind with a need to hike the gear back to the launch site. 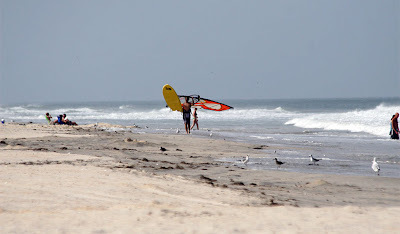 All in all, the Head Carry is a valuable technique to master for carrying both your light air and regular windsurfing gear. For Light Air enthusiasts the Head Carry is key for accessing the water. Of course, the AHD SeaLion at 7'6" in length and considerable light weight for its volume at 135ltrs is quite easy to Head Carry. Though for those with larger Light Air kits (I also head carry the NahSkwell 10'6" Stoller! ), the Head Carry is the way to go unless the board is simply "too heavy." Setting up the Head Carry involves a few steps dependent upon wind direction. 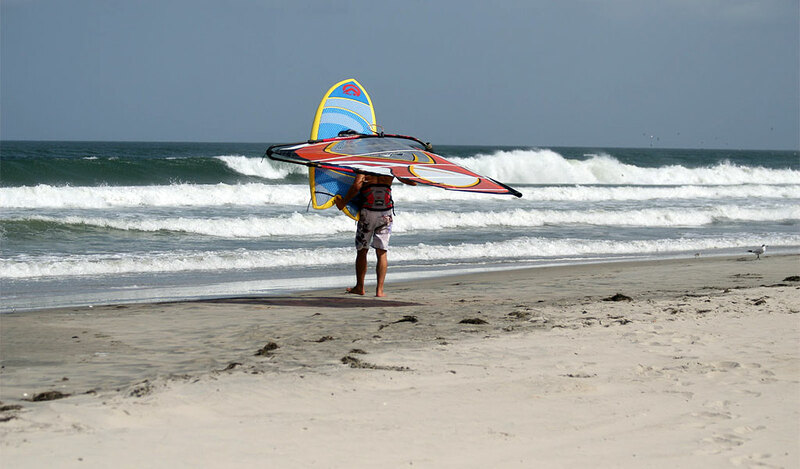 The board and sail should be laid out on the beach in a setup similar to a water start position with the sail on the downwind side of the board. Kneeling down, the arm crossover technique works to fly the sail with one arm while lifting the board up and into the wind. The combination of the sail air lift, board air lift, and some strength from the sailor will get the board up and the sail situated on the sailor's head. Note, do not place the your head on the middle of a sail panel, but rather place it at a seam, and as close to the mast as possible. Balance the sail as necessary with head position and control with the arm holding the sail. Basically, the wind should aid lifting the weight of the board along with some arm strength. 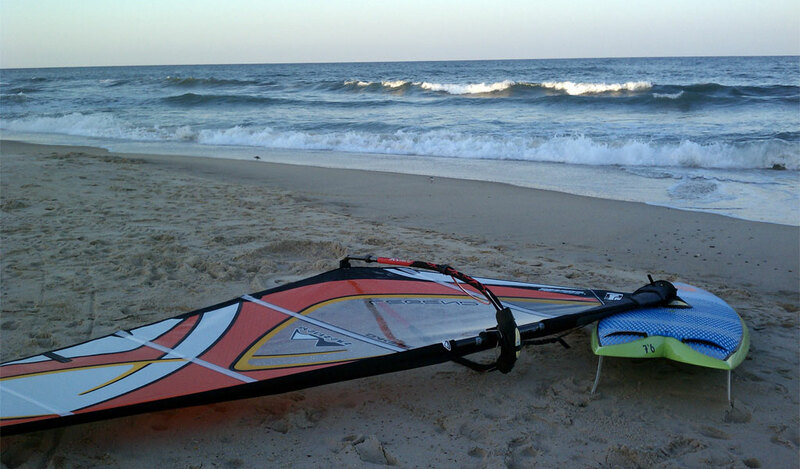 Of course, its best to practice this technique with your regular smaller windsurfing gear. Simply rig up your small kit and practice to become comfortable with lifting into a head carry along with walking and managing the kit on your head. Once comfortable with the small kit head carry, then this same technique can be taken to the larger light air kit. Exiting the ocean with the Head Carry is also key. Basically when exiting the ocean while in waist deep or less water continue a forward momentum when stepping off the board to drive the gear up into a head carry. Basically its the same as on land, however, the water depth lessens the kneel and the forward momentum of coming into the beach helps drive the gear up and onto your head. Again, this is best to master with regular gear and you can do this either in the ocean or even flat water/shallows such as the sound. Bottom line is that the Head Carry works quite well for getting light air kits into and out of the ocean. The technique should be mastered or proficient with smaller gear; however, the exact same technique is used for the larger light air kits. Note, if you do have a big light air kit and the head carry simply will not work, then next best is the "Railed Driver." More on this technique in a future post. very helpful! look forward to future light air tips! one quick question: without footstraps on these SUP boards, where do you recommend gripping the board while walking into the wind? Interestingly, as seen in the images, the SeaLion's swallow tail works quite well as a hand hold for the board while in a Head Carry. As for others, when I carry the NahSkwell Stroller, I work my shoulder under the board as I raise it into the wind while wrapping my arm and holding the opposite rail. Thus the board is sitting on my shoulder with my hand usually flat on the underside of the board, or gripped on the opposite rail. Balance is key here as I also use the light breeze to help hold/steady the board as I fly it while walking to the water. All in all, the SeaLion's swallow tail really helps with this particular board. Intriguing! I look forward to trying the carry with my 10'5" Starboard.I hate sliding the nose through the sand. 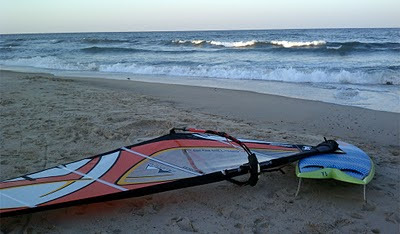 I extended my SUP wave sailing experience last Saturday in the Delaware Bay. Just unable to plane on small kit I launched my SUP in dead onshore bay swell that was breaking on a bar. 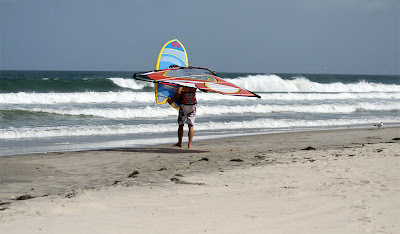 I could point upwind to the outside then ride a barely breaking swell dead down wind, going left or right as I pleased. Also reaching parallel to the onshore swell I would do extended jibes using the wave face for a several second surf-like experience. 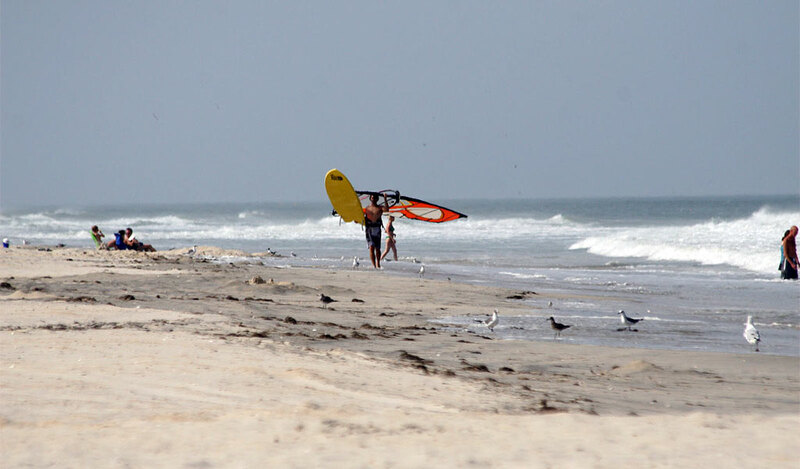 It was the good pointing ability of my SUP that afforded me the luxury to ride all those waves downwind. Had I been schlogging on a short board I would have had to jealously preserve any upwind progress. Light Air Wavesailing, Is it the New Thing?! Hatteras Light Air SUP Wavesailing Magic! OceanAir Ken is ON IT Light Air SUP!